The Christmas season ends with our celebration of the Lord's baptism. The greatest of gifts is ours in baptism: God's very own life and love. A life to overcome the death which is our inheritance from Adam's sin, a love to overpower and win us away from love of self to love of God for his own sake and our neighbours for his glory. Another of the baptismal gifts we receive is the ability, in Christ, to praise and worship the Father in the Holy Spirit, and to be found pleasing to God as we do so. The baptismal font was often placed in the courtyard or near the entrance of early churches, and the practice continues so in many places today. We "entered" the Body of Christ at the moment of our baptism. We became worshipping members of the Son, pleasing and beloved by the Father, through our baptism. This is why holy water fonts are placed near the entrance of our churches. 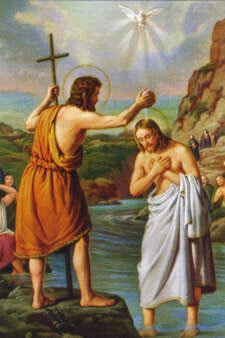 As you dip your fingers into the font and make the sign of the cross each time you enter the house of worship of the Lord, remember it is by the power of your baptism that you render fitting and pleasing worship to God in your spiritual sacrifice of holiness of life and, most fully, the Eucharistic sacrifice. It is by your bath in the waters flowing from the side of Christ the priest in his perfect offering that you have been incorporated into the one, holy, catholic and apostolic body of Christ in the world, his bride the Church.